Long time ago, astronomical observation was just looking up and seeing night sky. As the technology advances, large telescopes, and currently, satellites equipped with electromagnetic waves such as radio waves, infrared light, and x-rays are used for astronomical observation. Such advancement enables us to capture cosmic rays, including neutrinos, electrons, protons, and atomic nuclei coming from space. Currently, understanding “dark matter” is the urgent issue between the fields of space physics and particle physics. Dark matter is the unknown hypothetical matter which is extremely difficult to observe. However, existence of unknown matter that does not emit light and has mass only is believed as a result of observations of galaxy’s rotational velocity, gravitational lens effect, and cosmic microwave background. These observations suggest that among all the mass of space, the percentage we can observe is only 5%, and the other unidentified dark matter and dark energy make up 95%. To resolve the mystery, cosmic ray observation is receiving attention. To ascertain the existence of dark matter, electromagnetic waves flying about in space, as well as cosmic rays and high energy gamma rays (both rays hold energy with much higher than these of ultraviolet rays and X-rays) should be closely examined. Therefore, CALET will be installed to the Kibo’s Exposed Facility (EF) to conduct a long-term observation. 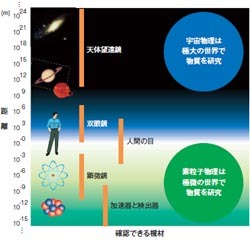 3. identity of dark matter. As a cosmic ray observatory, CALET aims to clarify high energy space phenomena and dark matter, etc. from two perspectives; one is particle creation and annihilation in the field of particle physics (or nuclear physics) and the other is particle acceleration and propagation in the field of space physics. 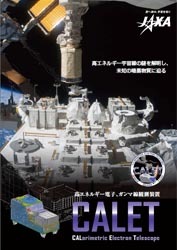 CALET will be installed to the Kibo’s EF. 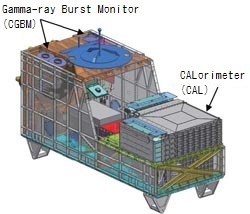 CALET is equipped with the latest detection technology and electronics called “CALorimeter” to determine the kind and flying directions of particles flying in space. The CALorimeter has been developed through balloon experiments which can measure electrons and gamma rays of very high energy, protons, and nuclear components. In addition, it measures gamma-ray bursts that emit huge gamma rays in a short time outside our Milky Way galaxy and the influence of solar activity on the Earth environment. Observation will be carried out for 2-5 years to elucidate high energy space phenomenena on in a wide area of space, from interplanetary space to the outside our Milky Way galaxy. 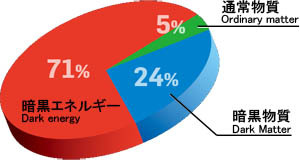 Participating organizations: Kanagawa University, Aoyama Gakuin University, Yokohama National University, Shibaura Institute of Technology, Ritsumeikan University, Institute for Cosmic Ray Research of the University of Tokyo, etc. By this observation, a new discovery that leads the world such as understanding the origin of the acceleration of high energy cosmic rays, gamma ray bursts that have different stories of their generation mechanism, as well as exploring dark matter which are still unexplained for 100 years since the finding of cosmic rays. High energy cosmic rays (primary cosmic rays) coming from space interact with the Earth atmosphere, creating the shower phenomenon followed by the generation of different particles (second cosmic rays) one after another. As such, cosmic rays lose their energy and at the same time much of the primary cosmic rays’ information such as kind and energy is also lost. Therefore, to realize a precise observation, observing in space becomes indispensable to identify incoming particles and measure the energy accurately. 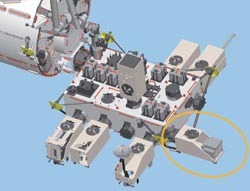 When conducting a space observation experiment using the dedicated satellite, the satellite should hold infrastructures such as attitude control, thermal control, and power distribution which constrain the weight allowance of the experimental equipment in the satellite. If the satellite is a large one, it alleviates the constraint; however, the development time, cost, and the failure risk will increase. Compared with developing specific satellites, since ISS Kibo provides its infrastructures with the experimental equipments, experiment efforts can be concentrated on the development of observation equipment which will result in a short-term preparation with lower cost. As the ISS circles the Earth every 90 minutes, it is suitable for observation experiments such as CALET which target all-sky observation.